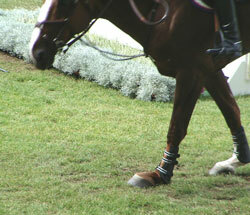 The suspensory ligament plays a vital role in stabilizing the lower leg. 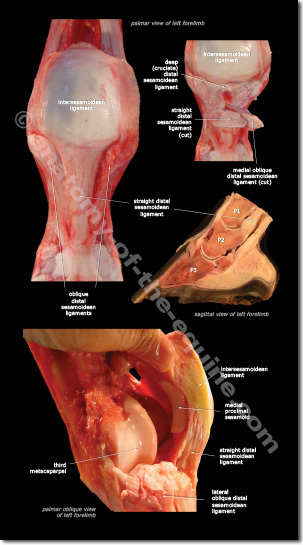 The suspensory ligament plays a very important role in preventing excessive extension of the fetlock during movement. If you compare the two photos below, it becomes clear exactly how much strain the suspensory can be subjected to during extreme sports. It is not surprising therefore, that this structure is frequently injured. The suspensory ligament has been highlighted with a yellow overlay. Photo of jumping horse courtesy of Dr. Gaspar Castelijns. The force energy the ligament is subjected to during strain is converted into forward/upward motion and is what gives the horse 'spring'. Think of a stretched rubber band that pings back into shape when it is released. This is an amazing engineering feat. The suspensory ligament does not work alone. There are many other structures that work in conjunction with this primary ligament. Collectively, they are referred to as the 'suspensory apparatus'. Here is a page from our latest project - Tendons & Ligaments Guide. It shows many of the other supporting ligaments that make up the suspensory apparatus. Despite the common belief that there are no muscles in the distal limb of the horse, there actually is some. 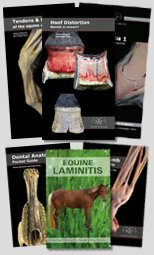 Many of the tendons and ligaments of the lower leg derive from muscle tissue and it is common to see them referenced as muscles in various anatomy books. 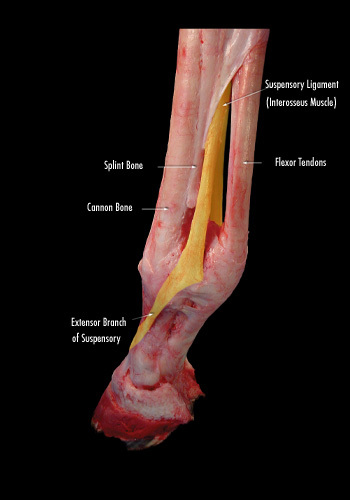 The Suspensory Ligament (SL) is not only comprised of ligamentous fibers, there are also some muscle fibers present. The suspensory is an evolutionary derivative of a muscle called the interosseous medius. Animals that have more than one digit share this muscle (primates, felines, canines). The SL is made up of predominately ligament fibers with some residual muscle fibers. The muscle fibers are more prevalent in the upper portion of the suspensory ligament. The variation in the amount of muscle fibers can create issues when diagnosing suspensory problems. It can be hard to differeniate between normal muscle fibers and damaged ligamentous tissue. 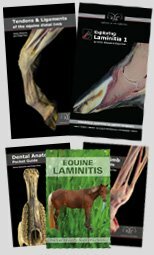 (The full article explains the suspensory in depth and can be accessed here). Since the SL derives from the interosseus medius it is easier to understand why many of the anatomy books refer to the SL as a muscle. In medical terminology, interosseous literally means: a muscle lying between bones. 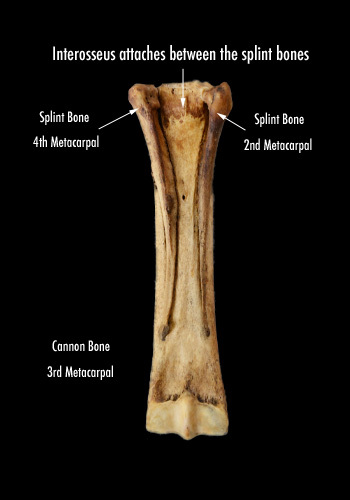 The suspensory ligament attaches in the channel created by the two splint bones. It is a muscle lying between bones.